The origin of this institution has already been alluded to in the history of the metropolis. On the faith of receiving a beneficent legacy of the Bishop of Orkney, amounting to 8000 merks, for founding a college, the magistrates, in 1563, purchased the precinct of the church of the Kirk-of- Field, and made some preparations for establishing a university, but being opposed in the undertaking by the Archbishop of St. Andrews, and the Bishop of Aberdeen, the work was not fairly begun till 1581. As formerly mentioned, the institution was much favoured at its outset by grants from Queen Stary and James VI. In 1583, it was so far advanced, that in the month of October that year, the first professor began to teach. This was the amiable Robert Rollock, who had been Professor of Philosophy in the college of St. Salvador, university of St. Andrews. A second professor was soon afterwards appointed, and the institution in a short time assumed the character of an ordinary college of education, over which Rollock exercised the office of Principal. The building occupied by the professors was at first a house which was the property and residence of the Earl of Arran, before his forfeiture, and had been originally a tenement belonging to the provost and canons of the old religious establishment. In 1616-I7, there was erected a college-hall with some rooms attached to it About the year 1640, through benefactions from public bodies and private individuals, the establishment had reached a respectable status. It had then a principal, a professor of divinity, a professor of law, and two other professors; the number of its students, many of whom were supported by bursaries, amounted to 320. The internal government of the university, at this period, seems to have been committed to a rector, appointed by the town-council. There never was a chancellor, as in other institutions of the kind, as the college was not founded till after the Reformation, when there was no bishop to exercise the function, or to bequeath it to a lay nobleman. The history of the university of Edinburgh is destitute of interest, and the celebrity which it enjoys is principally derived from the many great men who were its professors in the bygone century, and who established its reputation in different departments of philosophy and science. Before the reign of William III. it was disgraced and injured by the contests of faction, but since that time its career has been unmarked by any such disorders, and its affairs have grown daily more prosperous. The introduction of the study of medicine into the common curriculum of the university took place in 1720, and is the greatest event in the annals of the institution. At the end of the seventeenth and beginning of the eighteenth century the science of medicine was in a deplorable condition in Edinburgh, and the royal college of physicians being allowed to practise but not to teach, its knowledge was not applied to public instruction. From 1685 there had been a species of nominal professors of medicine, who concerned themselves very little with their duties. Several attempts were made to establish an anatomical school in Edinburgh, one at the instance of the celebrated Dr. Pitcairn, by Mr. Alexander Monteith, which was frustrated by the opposition of the Incorporation of Surgeons. In 1705, Robert Elliot was appointed by the town-council first professor of anatomy, with an annual salary of £15. At his death, in 1714, he was succeeded by Adam Drummond and John M'Gill. The school appears to have been in a very low state, until, at length, in 1720, Alexander Monro being appointed to fill the chair, he struck out a new path, and began a course of lectures on anatomy and surgery. At the same time equally spirited individuals commenced giving lectures on materia medica and botany, the practice of medicine and the theory of medicine. An hospital or public infirmary being also established, opportunities were afforded of giving clinical lectures. In a short time the Royal Medical Society of Edinburgh was instituted, such was the commencement of the school of medicine in Edinburgh, the fame of which has spread over every civilized country in the world. The university thus so distinguished, has been also singularly fortunate in generally possessing a series of professors, down to the present time, no less remarkable for their abilities as teachers of medicine and other branches of knowledge. In the decade of 1770, the college possessed Dr. Alexander Monro (secundus), as professor of anatomy and surgery; Dr. William Cullen — the great Cullen, who was appointed 1756, and whose works are still so deservedly popular — as professor of the practice of medicine; the learned Dr. John Hope, professor of botany; Dr. Joseph Black, professor of chemistry, whose industry and talents led the way to the important discoveries of modern chemistry; Dr. James Gregory, as professor of the theory of medicine, and who had succeeded his father Dr. John Gregory; Andrew Dalzel, as professor of Greek; Rev. Dr. Hugh Blair, as professor of Rhetoric and Belles Lettres; Dr. Adam Fergusson, as professor of moral philosophy; Dugald Stewart, as professor of mathematics, (afterwards moral philosophy;) and the principal was the Rev. Dr. William Robertson, the historian. It would hardly, we think, be possible to exhibit such a catalogue of names as celebrated in the annals of literature, in the roll of any Senatus Academicus in the past or present day. In more recent times there have also been some professors of distinguished reputation, and among others the late Mr. Playfair, to whom justly belongs the fame of being one of the best mathematicians and natural philosophers which the country has produced, and Dr. Thomas Brown, no less distinguished in the science of mind. The names of Chalmers, Leslie, &c. may prove that distinguished individuals still fill the chairs. In the course of the last century and the present, additions have from time to time been made to the number of professorships, and now the amount is twenty-seven, as follows: Divinity, Church History, Oriental Languages, Logic, Greek, Humanity, Mathematics, Moral Philosophy, Natural Philosophy, Natural History, Universal History, Scots Law, Civil Law, Public Law, Rhetoric, Botany, Materia Medica, Practice of Physic, Theory of Physic, Chemistry, Anatomy and Surgery, Midwifery and Diseases of Women and Children, Clinical Surgery, Military Surgery, Agriculture, Medical Jurisprudence, and Conveyancing. There is also a Principal, and the Lord Provost of the city acts as Lord Rector, which is quite a titular office. The magistrates and town council are the patrons of the university, and have the nomination to all the chairs except seven, which are under the patronage of the crown, and three, the patronage of which is shared by the Faculty of Advocates, Writers to the Signet, and Town-Council. The degrees bestowed are the same as in other Scottish colleges, namely, those of Doctor of Divinity, Doctor of Law, Master of Arts, and Doctor of Medicine. Not having been prostituted as in some of the other universities, the degrees of the Edinburgh Senatus Academicus are in deserved estimation. The terms of the college are a winter session of about six months, beginning in October and November, and a summer session of about three months, from May to August. During the latter session the lectures given are only in Botany, Natural History, Midwifery, and clinical lectures on Medicine and Surgery. The total number of students who matriculated in the session 1829-30, was 2186; the entries in the album divide them into the following classes: Students of General Literature 716; of Scottish and Civil Law 277; of Divinity 297.; of Medicine 896. The attraction of the Edinburgh Medical School is exhibited not only by its aggregate amount, but by the distances and various quarters from which the individuals composing it have come; the numbers were, from Scotland 525; England 1S7; Ireland 91; British Colonies 69; foreign countries 24; probably 200 additional students attend private medical lectures only, and therefore do not matriculate. The session of 1830-31 , not being completed, would not exhibit the whole numbers; it may be mentioned, however, that the number of medical students from England has considerably increased as compared with 1829-30. * The students at the College of Edinburgh do not wear any particular garb. The buildings used by the university may now be noticed. The whole of the old edifices primarily fitted up for the college existed till 1789, when they were found unfit for a large body of professors and students. With more precipitation than judgment, the magistrates came to a determination to erect a magnificent suite of university buildings, and having commenced the collection of subscriptions for that purpose, they laid the foundation stone of a new college, in the precincts of the old one, on the 16th of November 1789. The intended edifice was after a plan by Mr. Robert Adam, and on a very extensive scale. For a short time the work went on briskly, but the funds becoming exhausted, it was with difficulty the front part could be finished. The vanity, poverty, and want of judgment of the town were equally manifested in the design and execution of the structures. The patrons of the institution had not only conceived a plan they could not execute, but they had committed the irremediable blunder of pitching the new college buildings in a situation which was eventually found to be in the midst of the most bustling and noisy thoroughfares, and closely hemmed in on all sides by other buildings, so that the effect of the plan was entirely lost. For about twenty years the college stood less than half built, and it might have stood for ever in the same condition, had not the government, in 1815, been induced, through the solicitation of the member of parliament for the city, to make a grant of £ 10,000 per annum, to be expended in completing the edifice. The management being placed in the hands of certain commissioners, they decided upon a new plan by Mr. W. H. Playfair, for the completion of the structure, and thus little of the edifice besides the external fronts is to be considered as planned by Adam. By the aid of the above grant the whole building was completed and roofed about two years ago, and very little now remains to be done to finish the minor details. The buildings form a regular parallelogram with 1 a court in the centre, the north and south sides being 356 feet in length, and the west and east sides 255 feet. The east end forms the chief front, and is on a straight line with South Bridge Street. The stupendous proportions of this magnificent front are seen to great disadvantage, on account of the closeness of the street to the walls, and the more the edifice is examined it excites a deeper and deeper regret that it does not occupy the centre of some spacious park. In the middle of the front are the chief entrances, by lofty porticos penetrating the building, and, beside the main gateway, are two elegant columns, twenty-six feet in height, and each formed of a single stone. On the summit of the building, which is four stories in height, and altogether of Grecian architecture, is a large stone entablature, with the following inscription: "Academia Jacobi VI. Scotorum Regis anno post Christum natum m,d,lxxxiI. Instituta; annoque m,dcc,lxxxix. Renovari coepta; Regnante Georgio III. Principe munificentissimo; Urbis Edinensis Praefecto Thoma Elder; Academies Primario Gulielmo Robertson. Architecto Roberto Adam." The interior court is surrounded by a continuous range of buildings in a very tasteful Grecian style, with pillars, pediments, and open porticos. On the west side a great part of the edifice is devoted to a museum, on the south side is the library, the other places being devoted to class-rooms, and other accommodations. One of the professors has apartments within the building; all the others, as well as the students, live in the town. The Museum of the college, which is its chief attraction to strangers, (who are admitted on paying the sum of two shillings and sixpence,) is only of modern institution, but already is one of the best in the country, particularly for objects of Natural History. It is contained in a lower and upper room, each ninety feet long by thirty in breadth, and the higher, which is very handsome and tastefully fitted up, is lighted from the roof. The lower apartment is appropriated to the exhibition of quadrupeds and large animals, and that above it is furnished with a great number of fine glass cases, containing specimens of upwards of 3000 birds, foreign and British, all preserved with the most sedulous care. In a number of cases, on tables, are shown equally beautiful specimens of shells, insects, and other objects of natural history. Contiguous galleries and smaller apartments contain specimens of minerals, &c Towards the end of the seventeenth century, collections of objects in natural history were formed by Sir Andrew Balfour, and his coadjutor, Sir Robert Sibbald, but after the death of these persons, the whole went gradually to wreck, and when Professor Jameson was called to the chair of natural history, the whole was dilapidated and useless. With a praiseworthy zeal, this distinguished individual laid the basis of the new Museum, by bestowing on the College his own private and valuable collection of specimens. Some time later, a great addition was made by the mineralogical specimens of Dr. Thompson of Naples, and at a more recent date, an extensive collection of stuffed birds was purchased by the university from M. Dufresne of Paris. The Museum is continually-receiving additions from British residents and adventurers abroad, of all that is curious or rare, and it is not probable that it will ever again be permitted to fall into decay. It is much to be regretted that the price of admission is so high, but as there are no other adequate funds provided for its preservation, some fee seems necessary. There are also collections, attached to the classes on these subjects, of preparations connected with anatomy, &c. materia medica, midwifery, and physiology. The preparations in the Anatomical Museum have been chiefly bestowed by the grandfather and father of the present Dr. Monro, a name intimately associated with the character of the College as a school of medicine. The library of the College owes its origin to a bequest of books in 1580, by Mr. Clement Little, an advocate in Edinburgh, who left his library to the care-of the town-council, for the use of the citizens. Conceiving this to be a good opportunity of assisting the college, just at its commencement, the magistrates removed the books to the new institution. From that period to the present time the collection has been increased by purchases and donations, and also by free copies of books printed in Great Britain, agreeably to the well-known act of Queen Anne. Every student on matriculating pays 10s., which goes to form a fund for the support of the library; and every professor on his admission contributes £5. A part of the fees of graduates both in medicine and arts, is also paid for the same purpose. By an arrangement not at all singular in this country, no student can have a loan of a book unless he deposit the sum of one pound in the hands of the librarian, every volume taken out requiring a similar deposit. Books of reference may be consulted in the rooms. Although Mr. Little bequeathed his books entirely for the use of the citizens of Edinburgh, and although the public are the chief supporters of the library, by giving a free copy of every book printed in the united kingdom, it is almost needless to state that neither the inhabitants nor the public at large derive any benefit from the collection so formed. The library now consists of upwards of 70,000 volumes, a great part of which are works of divinity. There is also an excellent collection of books on theology and church history connected with the class of divinity. It is supported by annual contributions of ten shillings each from the students attending the class, who elect the curators. It contains a few objects of antiquity of a literary kind. The apartment devoted to the preservation of the books is one of the most magnificent halls in Scotland, and is perhaps only surpassed by that of the Advocates Library, or the new public room at Glasgow. It measures 198 feet long by 50 feet wide, and is fitted up with cases of books projecting at right angles with the walls. It is on the second floor, and is reached by a noble staircase. High as the character of the Edinburgh Medical School has been, it must be acknowledged that its celebrity does not entirely depend upon the university. In the present day this is especially the case. Though a regular curriculum at the College of Edinburgh or some other university is requisite to qualify for graduation, yet a diploma from the Royal College of Surgeons, which confers the same privileges, (excepting the title of M. D.) can be obtained without attendance on the College, the ticket of any lecturer if a Fellow of the Royal College of Physicians or Surgeons being received at Surgeon's Hall; a student may thus conclude his medical education without entering the walls of the University. There has in consequence sprung up a Medical School rivalling the University, and taught by a body of lecturers, many of whom are, or have been very celebrated in their several departments of science; among whom we may mention the names of Barclay, Murray, Thomson, and Knox While these gentlemen not only sometimes interpose to obviate the effects of an injudicious appointment by the town-council — the patrons of the university, they still farther contribute to sustain the reputation of the Edinburgh school, by the rivalry which their competition with the professors produces. The Royal College of Surgeons have under their patronage a lectureship on Surgery, filled by one of their own body. But the greatest benefit this college has conferred on the medical world has been in providing a museum consisting of a collection of anatomical preparations, human and comparative, principally pathological, perhaps unrivalled in value and extent in the British Empire; when placed under the care of their distinguished and indefatigable conservator, Dr. Knox, a few years back, it consisted of about 420 preparations; it is now increased to 10,000. This has been effected by the bequest of the museum of the late Dr. Barclay, by the purchase of the excellent collection of Mr. Charles Bell, and by the zeal and assiduity of the conservator. The College of Surgeons has expended a considerable sum on its formation, and on a beautiful and extensive hall and suite of apartments, now in the course of erection in Nicolson Street to receive it. Besides this, several lecturers, as well as the Royal Medical, Royal Physical, Plinian, and other societies, have museums connected with their different branches. The number of students registered in the books of the College of Surgeons was 744 in the winter session of 1829-30, and 772 in that of 1830-31. The earliest traces which have been discovered of a public grammar-school, countenanced by authority of the magistrates, are in the year 1519, when the town-council ordered the inhabitants to put their children to the High Grammar School, prohibiting them from putting boys to private schools to learn any thing above the character of a primer. After the Reformation, when the magistrates were at first unsuccessfid in rearing a college, they fell on the expedient of instituting a respectable grammar-school, and the spot they chose for the purpose, was on the grounds once occupied by the religious inmates of Mansio Regis, and now in their possession by the gift of Queen Mary. Here was reared a plain school-house, which was then in charge to two, and soon afterwards to four teachers. The year 1578 was the date of its commencement. The old school-house continued in use for about two hundred years, when in 1777 a new edifice was reared on its site, and on a greater scale. Latterly, a complaint began to be made, that the building was too small for the number that attended, and that the situation was far from being central, in consequence of the extension of the city to the north, and that there was a necessity for a new edifice, with enlarged accommodation, nearer the New Town. Though such a complaint was partly correct, the necessity of removal was probably enhanced by the institution of a new academy on nearly similar principles, by a private society, in the northern part of the New Town, which was calculated to injure the old establishment. For one, or both of these reasons, it was at length resolved by the magistrates to erect a new school- house in the New Town. 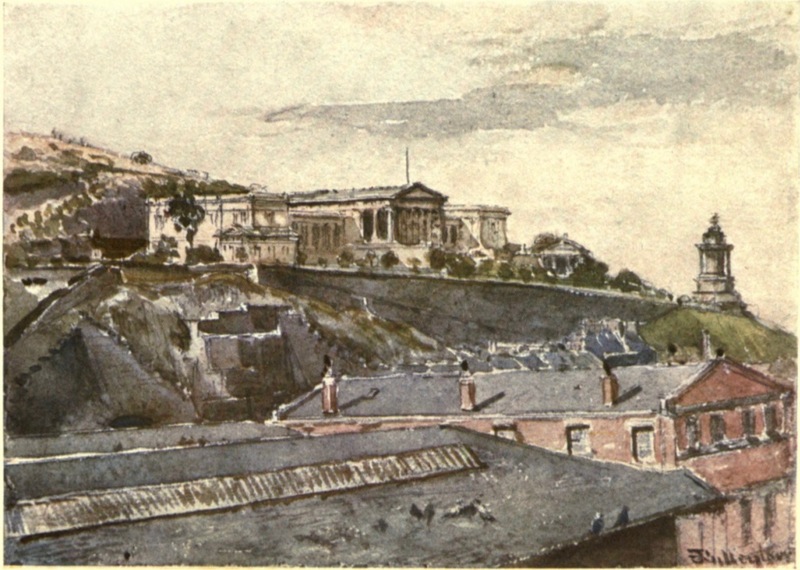 The place they selected was on the south face of the Calton Hill, on the right hand side in entering the town in that quarter. The site selected was one of the best which could have been pitched upon for the erection of a public building, though perhaps not very well suited for a school. On the 2Sth of July 1825, the foundation-stone of the proposed edifice was laid with great pomp. The building was erected after a design by Mr. Thomas Hamilton, architect, and is certainly one of the most splendid and striking edifices in the metropolis. This beautiful structure, which is formed of pure white stone, consists of a central and two end buildings, the latter connected with the former by an open corridor with columns. The centre building is simply a pediment advanced upon a range of Doric pillars, yet, being seen from a point below, it is one of the most fascinating objects in Edinburgh. It is reached by stairs leading from the enclosing walls in front. The terminating buildings are apparently flat roofed, and of plain architecture. The class-rooms, which are all entered from a spacious playground behind, consist of a hall of seventy-five feet in length by forty-three in breadth. The rest of the main building is occupied by the class-rooms of the rector and the four masters, and a library. The rector's principal class-room is about thirty-eight feet square, and those of the masters' thirty- eight feet by twenty-eight; to each there are attached two smaller rooms. Apart from the building, on the edge of the street, are two handsome lodges of two stories each; that to the east contains a writing class-room of about thirty six feet by eighteen, and another for mathematics and arithmetic, forty feet by eighteen; that on the west is used as a house for the janitor. The length of the building is about 270 feet, and two acres of ground are occupied by it and the play-ground; the hill having been greatly cut down on this side to afford a clear open space. About £ 30,000 were consumed in rearing the edifice, and a considerable part of the sum was raised by subscriptions at home and abroad. The educational arrangements are admirable. Although under the patronage of a close burgh, the masters, usually chosen, have been in many cases persons eminent for their literary acquirements, and at all times of respectable abilities as teachers. The system of tuition has been lately remodelled and improved, and since that time it has given proofs of deserving the widest public support. There are four classical teachers and a rector. Each of the teachers has a class, which he carries through a course of study for four years, after which, it is consigned to the rector, under whose charge the classical course is concluded by one, two, or three years of instruction, when, it is understood, the boys are fitted for the university. The fees chargeable are 15s. quarterly for the four junior classes, in which Latin and Greek are taught; 16s. for the rector's class, and 5s. annually for library and janitor; there are no other charges. Attendance on classes in which general knowledge, French, writing, mathematics, &c. are taught is optional, but is generally given, and the fees for these are additiona£ The fees form the salaries of the masters, who, besides, have small annual allowances from the town. The whole school is examined annually in August, when premiums of medals and books are distributed. The number of boys at present in attendance is between seven and eight hundred. This establishment has the same objects in view as the High School, though, as constituted and managed, its benefits are more confined to the youth of the higher classes in the metropolis. It was begun by a Society with a capital of £ 12,900, which may be augmented to £ 16,000, raised by proprietory shares of £50 each; and the superintendence of the establishment is vested in fifteeen directors, chosen by the proprietors from their own body. The practical details of the teaching in all the classes are under the superintendence and direction of a rector, with a master for English language and literature, four for classics, one for French, one for mathematics with an assistant, and one for writing, with an assistant. A regular course of study is prescribed, and the length of the period of tuition is seven years. Nearly the same method is pursued as at the High School in regard to the continuance of boys with the same master, and their transfer to the rector. The fees are considerably higher than at the High School, and are payable half-yearly. Those of the first class are £7, second £ 9, third £ll, fourth £ 11, 10s, fifth £ll, 10s, sixth £ll, 10s, and seventh £ll, 10s. The number of boys in each class is limited to one hundred and ten. Boys are admitted in the order of application. The annual examinations are conducted in a rigorous manner, and if the whole order of study be examined, and the length of the course be taken into account, it will be found that this, as well as the High School, is an excellent academy, preparatory to entering the universities. The number of boys in attendance is about five hundred. The school-house is a spacious, neat, low building, situated north from Fettes Row. Besides the common grammar school, there is a considerable number of private academies conducted by respectable teachers. The number of private teachers of the classics, writing, mathematics, music, and modern European languages, is indeed very great, and probably in a greater proportion than in any other town in the world. There is also a variety of permanent and day boarding schools for young ladies. Recently a society was formed for the establishment of a Drawing Institution, which is now constituted, and has met with considerable success. It is situated in Hill Street. It is a subject of serious regret that there are no regularly established parish schools in Edinburgh, on the principles of the ordinary Scottish parochial institutions. To remedy a defect of so injurious a nature, the kirk-sessions of the different established churches jointly patronise an establishment called the Sessional School, which is situated in a central part of the town near the back of the Bank of Scotland, and is a neat commodious edifice fronting the New Town. Here, about 500 children are taught the elementary branches of education on excellent principles, at a charge of not more than sixpence a month. The school was begun with a view to repress juvenile delinquency, and has been so successfid that it might well convince the public of the utility of erecting a series of institutions on the same plan. Enough of praise cannot be bestowed on the meritorious exertions of John Wood, Esq. sheriff of Peebles-shire, in bringing this educational establishment to that state of comparative perfection it now exhibits. To insure the benefits of the same plan to the children of the upper classes, a school on similar principles has been opened in Circus Place. The fees are high. A school called the City's School, patronised by the magistracy, is conducted in Niddry Street, at which above one hundred children "are taught reading, writing, arithmetic, and the principles of the Christian religion. There is also a free school, called Wightman's, in the Lawnmarket, and another, Lady Maxwell's, in the Horse Wynd. An Infant School has just been instituted by a society, and is supported by subscriptions. The plan of education is that pursued by Mr. Wilderspin. A large and handsome school-house has recently been erected in the parish of St. Mary, near Canonmills, under the auspices of the congregation of St. Mary's Church, for the elementary education of children in that neighbourhood, on moderate terms. In Broughton Place there is an Episcopal Free School, in connexion with St. James's Chapel, founded and endowed for ever by the late Colonel F. J. Scott, for educating boys and girls according to the principles of the Scottish Episcopal Church. It is under a master and mistress, and educates a great number of children. In Richmond Street there is a very large school under the direction of the Edinburgh Education Society, where the elementary branches are taught partly on Lancastrian principles. It is well attended by boys and girls, and the fees are very moderate. The Roman Catholic communion has a large school in the Old Town, conducted on quite as liberal principles as those of protestants; and some other congregations, as well as particular clergymen, have also schools more or less depending on their patronage or support. The chief establishment of this kind is in Young Street, attached to St. George's church, and was under the particular patronage of the late Dr. Andrew Thomson. In the metropolis and its vicinity, there are now a number of Sunday Evening Schools taught by pious individuals. By a calculation made by the ministers of the city, in 1826, and given in a Parliamentary Return, there were about, one hundred and fifty private schools of different descriptions in the (then eleven) city parishes, and the Canongate, which were attended by pupils from the number of thirty to three hundred. In all probability there are now fifty additional schools. Edinburgh has the merit of having been the place in which one of these exceedingly useful institutions was first established. The account of its origin and properties is thus given in the Book of Scotland: "One day in March 1821, in the course of a conversation in the shop of Mr. Bryson, watchmaker, a question was put, whether young men brought up to the trade of watchmaking received any mathematical education; and Mr. Bryson having replied that it was seldom, if ever the case, and that they daily experienced this want of instruction & it was immediately projected to institute a School of Arts, where instruction in the useful branches of science might be given to young tradesmen. The plan so started soon met with warm approbation from masters and working artizans, and a committee of persons interested in the measure being appointed, a prospectus was issued. On Tuesday, October 16, 1821, the school was opened by the Lord Provost, accompanied by some distinguished citizens. It was proposed to combine, as at the Andersonian Institution, the immediate tuition of individual students, with the charge of small fees for attendance. At the opening 292 tickets were sold, and the number has now increased to 500 annually at 10s. each. The students are young men belonging to every mechanical and trading profession in the town. There are junior and senior classes. The system of instruction has been considerably improved since the commencement. Lectures are given and instruction conferred by the exhibition of diagrams and models every evening from eight to nine o'clock. The session is from October to Apri£ Every evening the lectures are on different subjects; Arithmetic, Algebra, Mathematics, and Geometry, occupy attention one night; Chemistry another; and Mechanical Philosophy another. There are now also lectures delivered on the manifestations of a Divine Agency in the structure of the universe, and the intimations of the will of the Author of nature, afforded by the study of physical science; and also lectures on political economy. There are occasional lectures on architecture and classes for drawing. Examinations are made of students who voluntarily offer themselves, and prizes are now distributed by the aid of an annuity of ten pounds, from a society of Scottish gentlemen in Cambridge. The general arrangements of the institution, which is under the patronage of a large body of respectable citizens, are excellent, and every succeeding year it is found to be of more use to society. The students are under the guidance of several talented regular lecturers, and they are occasionally instructed by other gentlemen, whose experience in practical chemistry and general knowledge render their services of value. The institution possesses a small, but select and useful library, and collection of apparatus and models. Hitherto the lectures have been given in Masons' Hall, but it is proposed to erect a special hall of meeting among other new edifices now on the eve of being built in the metropolis." This institution is of modern date, and originated in a number of noblemen and gentlemen connected with the military and naval service, who were of opinion that the formation and permanent establishment of a military academy in Edinburgh, would be attended with many important benefits, not only to those intended for military and naval pursuits, but also to the civilian, whether destined to remain at home or become a resident in a foreign country. One of the advantages calculated upon, was, that the parents of Scottish youth designed for military or naval life, might here have their children educated under their own eye, or under the charge of friends, instead of sending them to similar institutions in England, where, though their education might be perfectly good, their moral conduct could not be so effectually superintended. Meetings having been called, and the public being favourable to the institution, a society was formed by the sale of shares (establishing a capital of £3000) and the receipt of donations; office-bearers were chosen; and on the 8th of November 1825, the academy was opened. Since its origin a great degree of success has attended the academy, and it is yearly becoming of more extensive application, and the more appreciated by certain classes of the people. "The leading object in forming the institution has been to establish in Scotland a seminary where young gentlemen, intended for the army, navy, or the East India Company's civil or military service, might obtain a systematic course of education, necessary to qualify them for any of those departments, upon moderate terms. The institution is also highly advantageous to those gentlemen who have no views either to the army or navy, by providing the opportunity of acquiring a knowledge of those sciences and modern languages which are indispensable parts of polite and liberal education, and likewise an acquaintance with the fencing and gymnastic exercises, which tend so much to strengthen the constitution, and to give an easy and manly carriage." In pursuance of this object no pains have been spared by the directors to procure respectable and qualified teachers, of whom there are now ten. There are classes for fortification, military drawing, surveying, landscape and perspective drawing; arithmetic, algebra, and geometry; higher mathematics, natural philosophy, and navigation; elocution, geography; the French, Italian, German, Spanish, Hindoostanee, Persian, and Arabic languages; fencing, gymnastics, and military exercise with the firelock and broadsword. The quarterly fees vary from £ 1, 1s. to £2, 1 2s. 6d. each class. The number of pupils from the commencement averages about fifty eveiy year, and it is confidently anticipated that this number will increase. The establishment is sustained by a body of proprietors who have shares of £ 10 each; subscribers who pay one guinea or more per annum; and donors. The government is reposed in a body of honorary office-bearers; twenty-seven extraordinary directors; fourteen ordinary directors, with a chairman; trustees, &c. The king is patron. The academy is accommodated with a suite of spacious and elegant apartments in the new buildings, Lothian Road, for which an annual rent of £120 is at present paid. It may be added that the directors meet weekly or often er, and examine the reports of the teachers, so as to preserve a high spirit of discipline. They also distribute prizes and give certificates to such of the students as distinguish themselves by their abilities and attention; and these certificates have already been found of important service to the young men in their after pursuits in life. Chambers, Robert. The Gazetterr of Scotland. Edinburgh: Blackie and Son, 1838. Internet Archive online version digitized with funding from National Library of Scotland. Web. 30 September 2018.